Most satellites are in Low Earth Orbit. Some other satellites are in Geostationary Orbit because their function requires it. Why to they need to be in such a high orbit? Clearly the GPS design does not require that they need to be in GEO. The GPS wikipedia page mentions that with this orbit, the satellites have an orbital period of about 12 hours, and thus follow the same track over the earth - this was useful for debugging when the system was first being set up. But surely a similar effect could have been achieved with an 8 or 6 hour orbital period (or some other divisor of 24) for much less expense. Initially (and still) a military project, having the satellites in such a high orbit makes them harder for the enemy to shoot down. Being higher up means more satellites are in line-of-sight to any given point on the surface of the earth. I don't know how many satellites would be required for the same level of service if they were at the 8 or 6 hour period orbit, though I'd be interested to see how the costs compare to put more satellites in lower orbits. LEO satellites are more affected by atmospheric drag, so will need to perform more regular station-keeping maneuvers. Presumably they need to be temporarily taken out of GPS service when performing these maneuvers - perhaps this is unacceptable within the GPS design. Also more fuel is required for station-keeping, or there will be shorter service lives which perhaps offsets the extra expense of the higher orbit. So, why are GPS satellites in such high orbits? The main reason they are in such a high orbit is to allow for more of the Earth to be visible at any one time. In order to have a reasonable amount of the Earth visible, you have to be high up. A lower altitude could in theory work as well, but the chosen altitude seems to be a far enough distance to be useful, but not so far as to have communication link issues, etc. It should be noted that every other GNSS system that has been launched uses a similar orbit to GPS. 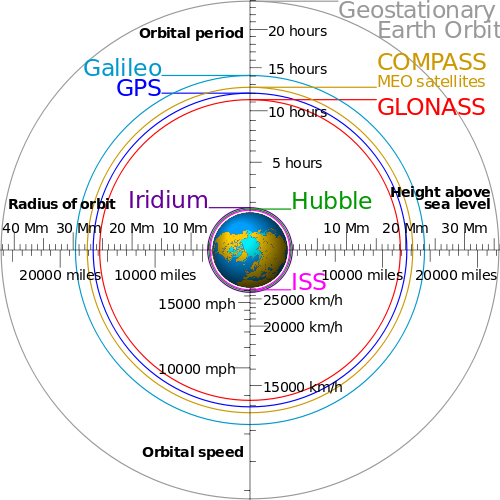 GLONASS is 8/17 of a day, BeiDou 9/17, and Galileo is 10/17. India is working on a system using purely GEO satellites. These chose a similar band because GPS proved it worked well at those altitudes. Another factor is the orbital velocity. The orbital speed at a 6 hour orbit is about 5 km/s. At GPS, it is 3.8 km/s. This slower speed allows for a narrower bandwidth (since the Doppler frequency shifts are smaller), using less spectrum and allowing more channels to be in use. There are other reasons as well, involving the accuracy of the GPS. That particular altitude works well to provide sufficient accuracy. Bottom line, the altitude that GPS is at works quite well for it, there are few other spacecraft using such orbits making them more stable overall, and it seems like a good idea to continue using GPS satellites in the 12 hour orbits they are being placed in. This ground track repeatability was important in the early days of GPS, so that sufficient ground coverage was assured (in sessions, not really all day long) with a much smaller number of constellation satellites. 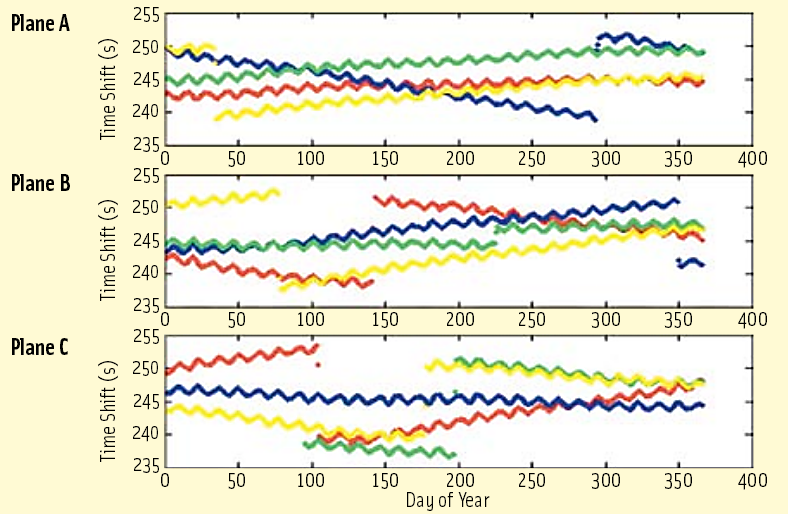 Lower orbits would have been subject to stronger orbital perturbations, especially the already mentioned nodal precession due to Earth's shape being an oblate spheroid and not a perfect sphere, so satellites' East-West drift rate would have been higher, while not completely eliminating other perturbing effects (such as the Sun's and the Moon's gravity, solar radiation pressure, ...) or would have been higher still (atmospheric drag) and causing higher orbital decay rate or otherwise require more frequent orbit corrective burns. This is explained in more detail in June/July 2006 issue of Inside GNSS, in the GNSS Solutions: Orbital precession, optimal dual-frequency techniques, and Galileo receivers article by Penina Axelrad and Kristine M. Larson. The short answers is to ensure ground track repeatability. And the period is not 12 hours but half a sidereal day (that is about 4 minutes shorter), so that when the earth have done one rotation, the satellites have done two and the geometry of the whole constellation relative to earth is the same than one sidereal day before. Repeatability is important for multiple reasons, one of them been that some errors related to the atmosphere or ground reflections (i.e. multipath) are dependent on geometry. If the geometry is the same each sidereal day the errors will be similar, therefore the displacements computed in a sidereal-day-to-sidereal-day basis are very accurate, because been the errors so similar they cancel out when computing displacements (or speeds). Also corrections of atmospheric effects or multipath effects are much easier to calculate and reuse if the ground tracks repeat (which is the same than saying that the satellites return to the same positions in the sky every one sidereal day). Now another question is why to choose half sidereal day instead of a third or a quarter. I'm not 100% sure about this but I'm pretty confident it is due to the fact that in contrast with other satellites, for GPS satellite to be useful their position has to be know with really high accuracy and in real time, so for this to be achieved, the bigger the orbit the easier, because of slower speed and smaller perturbations due to the non-central gravity field of the Earth, and atmospheric drag. So why not orbits with one full sidereal day period? Probably due to cost (to get them to the orbit and to transmit with more power), so half a sidereal day was the cheaper that still allowed to meet the satellite position accuracy specifications. Not the answer you're looking for? Browse other questions tagged artificial-satellite orbit gps gnss or ask your own question. Why are orbital periods different for different GNSS positioning system constellations? What is the highest non-equatorial earth orbit used?